Coachmen was founded in the 1960s to manufacture travel trailers, campers, and truck caps. Since then, they have branched out to add motor homes, fifth wheels, toy haulers, and pop up campers to their lineup. Coachmen was operated as a private company until the early 1980s, after which it became a publicly traded, fortune 500 company, and one of the largest manufacturers of RVs in North America. In 2008, it was purchased by Warren Buffet’s Berkshire Hathaway and became a division of Forest River. Coachmen offers two lines of pop up tent trailers in a range of sizes. Their smallest pop ups weigh in at a little over 1,300lbs (~2,000GVWR) with hitch weights of about 120lbs, and their biggest units are over 20 feet long with GVWRs of over 4,000lbs. 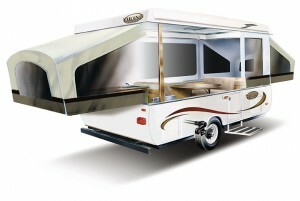 Although most of Coachmen’s pop ups are tent trailers, they also have a handful of hardside a-frames. Clipper LS 12' 2" - 14' 2" 120 - 210 lbs. 1,305 - 1,786 lbs. 2,098 - 2,300 lbs. Clipper Sport 12' 8" - 18' 3" 116 - 214 lbs. 1,503 - 2,326 lbs. 2,096 - 3,481 lbs. Viking LS 12' 2" - 14' 2" 120 - 210 lbs. 1,305 - 1,786 lbs. 2,098 - 2,300 lbs. Viking Epic 12' 8" - 18' 3" 116 - 214 lbs. 1,503 - 2326 lbs. 2,096 - 3,464 lbs. Viking Legend 14' 0" - 18' 5" 241 - 282 lbs. 1,344 - 2,975 lbs. 2,148 - 5,579 lbs. Viking V-TREC 16' 9" - 21' 4" 252 - 420 lbs. 2,233 - 3,065 lbs. 3,994 - 4,380 lbs. Viking Legend Hardside (A-frame) 16' 7" - 20' 2" 222 - 320 lbs. 1,946 - 2,165 lbs. 3,635 - 3,642 lbs.